Encoder/Signal Cable PUR UL/CSA acc. 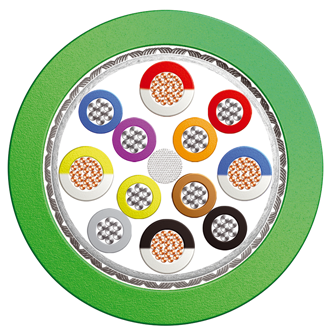 to Siemens standard 6FX5008 | Belcom Cables Ltd.
Interconnecting encoder cable for chain systems. •Oil Resistant VDE 0472 part 803/B (04/1980) EN 60811.2.1, VDE 0282 P.10 HD 22.10 S1 •Refrigerant Oil Resistance (OF Type), CNOMO E.03.40.150 NFT 46-013 •Flame Resistance CEI EN 50265-2-1, DIN EN 50265-2-1, NFC 32070 C2, IEC 60332.1.1 •Flame Resistance (OF Type) CEI 20-22/11, DN EN 50266-2-5 NFC 32070, Cat.C1 Test 2, IEC 60332.3.24 Cat C •Toxicity (PUR Type) Halogen free.